Becoming: Between myself and the material with which I create, no tool intervenes. I select it with my hands. I shape it with my hands. My hands transmit energy to it. In translating idea into form, they always pass on to it something that eludes conceptualization. They reveal the unconscious. Magdalena Abakanowicz was born in 1930 and and spent her early years on the family’s estate about 200 miles east of Warsaw. There, she often played in the nearby forest, an experience that later influenced the materials she uses in her work. Her family had both Tartar and aristocratic roots (the term Tartar has a complex history but in this case the artist’s father was a descendant of Abaqa Khan, a thirteenth-century Il-khan of Persia). Who were Abaqa Khan, Il-khan, and Ghengis Khan? Abakanowicz graduated the Academy of Fine Arts in Warsaw in in 1955. Post-war Poland was part of the Soviet bloc and had a Communist government. 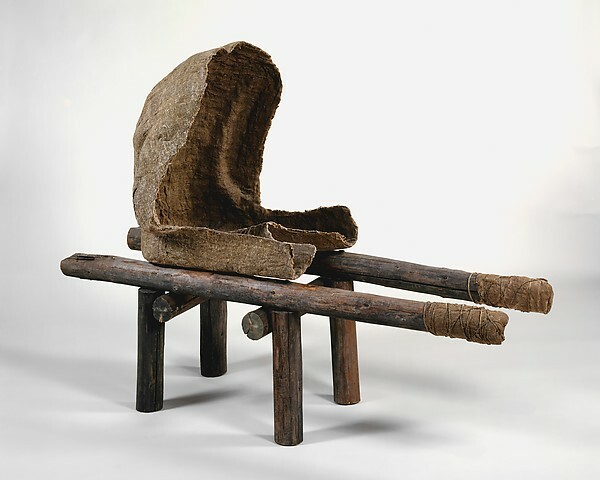 Social Realism was the style taught in art schools during this era and initially Abakanowicz experimented with textiles and weaving in order to avoid it. Social Realism demanded images of smiling workers and a perfected society and although Abakanowicz disliked the style, she was ultimately required to adopt it in order to obtain a degree and enter the Polish Artists Union—a step required of all professional sculptors. What is Socialist Realism? Throughout her life Abakanowicz has continued to live in Poland despite the communist government that held power there until 1989 and the hardships that she and her fellow Poles endured. After Joseph Stalin’s death in 1953 there was considerable hardship in Warsaw but also a flourishing of the arts. Abakanowicz attended gatherings of artists, intellectuals, scientists, and politicians in the one-room apartment of the Polish Constructivist painter Henryk Stażewski. Who was Joseph Stalin? 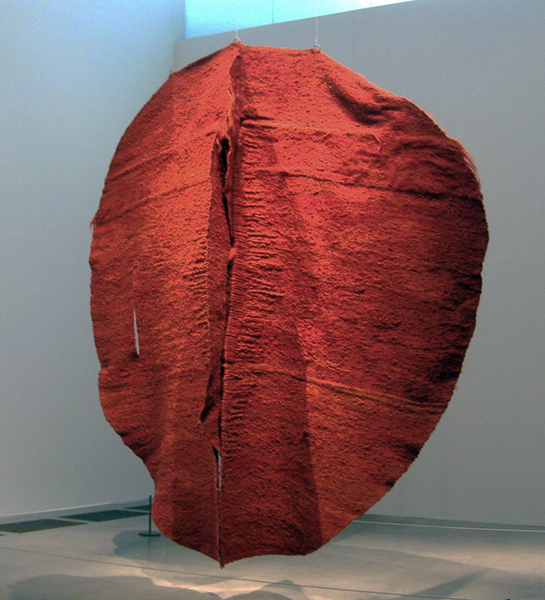 In 1967 Abakanowicz began creating forms made with fabric and tapestry. She became well known for work she called Abakans (left), a series of monumental fiber sculptures that created the framework for her later work. The Abakan sculptures refer to clothing but are not functional. They hang from the ceiling and although they allude to human figures, they also reference the natural world. Some gently swing, suggesting the rocking of underwater vegetation, or the flight of birds. In the 1970s, Abakanowicz began to experiment with other materials including burlap, string, and cotton gauze. In 1974, she began to form figures by dipping burlap and string into resin, which she then pressed into a plaster mold. Sometimes she took a cast from the body of a friend for these forms. The figures are hollow and repetitious as can be seen in Seated Figures (1974-79) and Backs (1976-80). 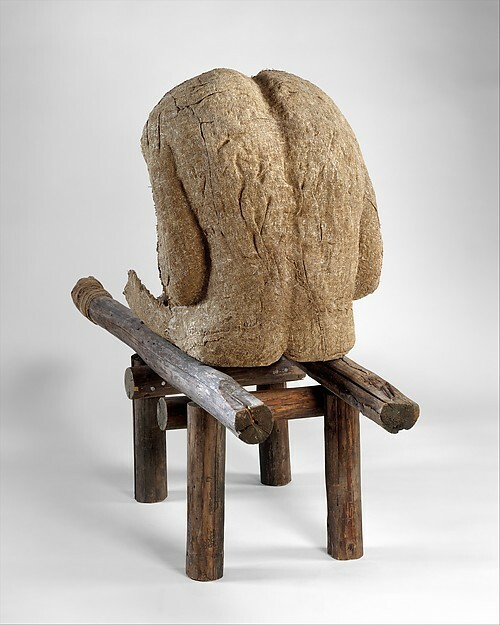 The body as a structure became increasingly important to Abakanowicz and she visited laboratories to learn more about dissection and the construction of the human body. The effect of Seated Figures and Backs can be chilling and is often understood as expressing dehumanization in the twentieth century. In these works, the same shape is repeated but the surface of each figure has an individual texture, the result of Abakanowicz’s unique handling of the materials. Androgyne III uses the same molded-torso shell that Abakanowicz employed in her sculpture series Backs (1976-1980). The piece is made of burlap, resin, wood, nails, and string. Unlike the Back series, however, in which the figures sat directly on the floor, the Androgyne torsos are seated on low stretchers of wooden logs, perhaps filling in for lost legs. Abakanowicz’s figures are mostly androgynous, with their sexual characteristics de-emphasized. The artist wants the viewer to focus on the humanity of the figures rather than their gender. At the same time, the fragmentary nature of the figures is important, perhaps a reflection of the time she spent helping in the hospital during World War II and her memories of the attack on her mother. A distinguishing feature of all of the burlap casts is the wrinkled skin and the implication of backbones, musculature and veins. The bodies, or body parts, more accurately, are intended to be seen in the round as the hollow interior is as much a part of the piece as the molded exterior. Space is as significant as mass in these works. Abakanowicz draws on her personal history, but her sculptures possess an ambiguity that encourages multiple interpretations that speak broadly to human experience. Androgyne III alludes to the brutality of war and the totalitarian state. The body is a husk without arms, legs or a head. It is an expression of suffering, both mournful and disturbing. Michael Brenson, “Abakans.” Art Journal, Spring 1995, vol. 54, issue 1, pp. 56-62. Michael Brenson, “Survivor Art,” The New York Times Magazine, November 1991, vol 142, issue 49165, pp. 46-53. John Dornberg, Smithsonian Magazine, April 85, Vol. 16 Issue 1, pp. 110-119. Joanna Inglot, The Figurative Sculpture of Magdalena Abakanowicz: Bodies, Environments, and Myths, (Berkeley: University of California Press, 2004). Mara Witzling, ed., Voicing Today’s Visions: Writings by Contemporary Women Artists (New York, NY: Universe Publishing, 1994). Cite this page as: Dr. Mary Kinnecome, "Magdalena Abakanowicz, Androgyne III," in Smarthistory, November 28, 2015, accessed April 21, 2019, https://smarthistory.org/magdalena-abakanowicz-androgyne-iii/.